Different control devices use different "languages" when communicating with controllers. The NSI Protocol and Auto Sequence Converter converts CMX signals to DMX 512 signals that can be read by most current-day control boards. Also programmable as a stand-alone auto-sequence control device. 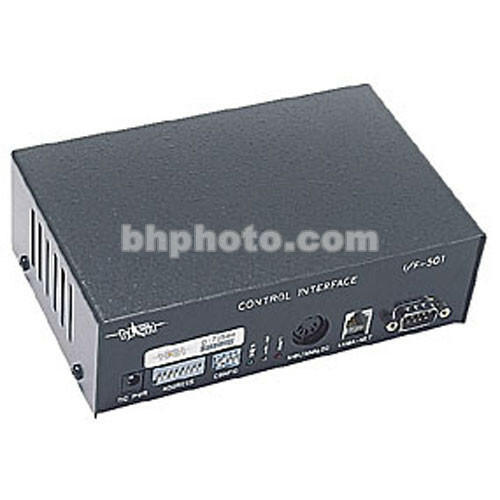 Up to 512 control channel address accesses. Eight preprogrammed corssfading chase effects with step times from 1 to 60 seconds may be selected. Twenty cue sequence with fade and wait times from .1 second to 50 minutes may be programmed into the memory via the RS-232 port, and triggered remotely. Box Dimensions (LxWxH) 8.25 x 8.25 x 4.375"